What Is the Pawpaw Fruit? The pawpaw, also known as the poor man's banana, is a fruit that is native to the Americas and has a flavor that combines some of the elements of the pineapple, coconut, banana and the mango. The pawpaw fruit has a variety of uses and can be eaten raw or prepared. It grows on the largest fruit tree that is native to the American continents. The pawpaw is an oval fruit between 3 and 6 inches long and pale green in color. Seeds are large, up to 1 1/2 inches in length and the flesh of the fruit has a tropical taste with a creamy texture. The skin of the fruit is thick, but the ripe fruit will have a soft texture. Fruits grow in clusters of up to nine, similar to the banana. Nutritionally, it is high in protein, carbohydrates and good fats. The pawpaw is similar in appearance to the papaya, but the two fruits are entirely different. 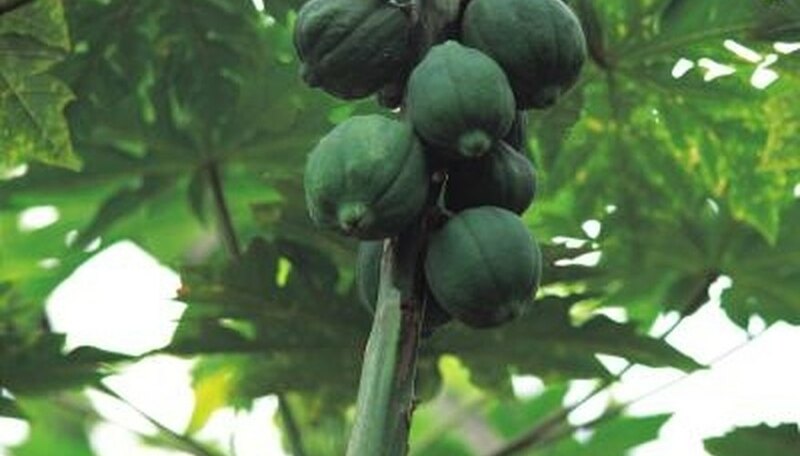 To add to the confusion, in Australia the papaya is also known as the pawpaw. Pawpaw trees have a tropical appearance that is appropriate, considering the fruit's tropical flavor. The leaves are up to a foot long and oval, dark green in the summer, and they turn yellow in the autumn months. The tree is deciduous, so it will lose its leaves in the winter and grow again in the spring. The leaf loss in the winter is crucial to the development of the fruit, as the tree must be exposed to the cold winter chill and go through the dormant period in order to fruit again in the summer season. The blossoms that will turn into fruit develop from the parts of the tree where previous leaves were connected. These blossoms are dark brown and each one can develop into several fruits. Growing a fruiting pawpaw tree can be a challenge; for the first two years, the tree requires only filtered sunlight and partial shade in order to reach a mature size of between 12 and 20 feet. Once the tree has matured and is ready to start fruiting, full sun is needed. Trees should be kept moist but not wet and they are relatively low-maintenance as they are pest- and disease-resistant and require little pruning. In order to get the best crop yield, the tree can benefit from applications of fertilizers high in potassium. This is the macronutrient that encourages the development of seeds and fruits and when applied during the blossoming period, the tree will receive the full benefits of the fertilizer and develop healthy fruits. The pawpaw fruit can be eaten raw or prepared and can be made into a number of dishes such as custards, pies, cookies, cakes and bread. Its creamy texture makes it ideal for making milkshakes and ice cream and it holds up to freezing well. The pawpaw is also being studied for its medicinal uses, especially in the field of cancer research. It has been found that the twigs of the tree and to a lesser degree the fruits, contain a chemical called acetogenin. Scientists are researching the potential benefits of including this chemical in cancer treatments. What Are the Different Types of Mangoes?